LC Waste Services are specialists in roll on roll off container hire. Our range of roll on roll off waste containers provide a cost effective, environmentally friendly solution for large quantities of heavy or bulk waste. Our RoRo hire rates are competitive and our waste containers are available at short notice on long or short term contracts. Available in various sizes including 15, 20, 30, 35 and 40 cubic yards so why not give us a call today for the best rates in Manchester. Call us on 0161 7369084 or request a waste container hire quote online. 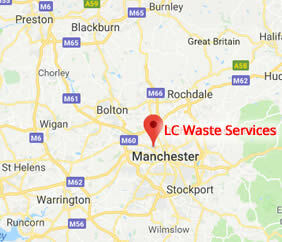 Conveniently based in Manchester, we offer waste container hire in Manchester, Salford, Bury, Wigan, Atherton, Leigh, Chorley, Preston, Oldham, Rochdale, Heywood, Stockport, across Lancashire, Cheshire and Greater Manchester. Call for more information on 0161 7369084 or request a RoRo Hire Quote online.